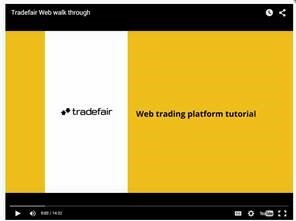 Our latest offering, Tradefair Web enables you to spread bet, trade CFDs or FX from the same platform. What are the benefits of Tradefair Web? Deal through charts: Now, there's no need to switch back and forth from the deal ticket. Trade the markets, place and amend orders directly on the charts with this easy to use and timesaving feature. One-click dealing: Increase the speed with which you trade the markets to make sure you don't miss out on trading opportunities in fast moving markets. Alternatively, switch to double-click dealing. Fully customisable screen layouts: Create the perfect trading screen layout to suit your style and preferences with our highly customisable features. Multiple Charts embedded into platform layouts: Want to watch multiple charts at the same time? Advantage Web allows you to embed multiple charts into your chosen platform layout. Ease of Use: The intuitive interface and highly customisable features create a trading experience that's simple, easy to use and can be suited to anyone's preferences. Watchlists: Create and amend multiple watchlists, grouping together individual markets to suit your trading needs. Trade from any computer with Tradefair WEB! *Occasional visual glitches may be experienced on these browsers.